An 1880s cottage in Sydney is carefully modernised while staying true to the timeless principles of honest construction, quality materials and abundant light. “Have nothing in your houses that you do not know to be useful, or believe to be beautiful.” This famous phrase by William Morris, founder of the Arts and Crafts movement, aptly describes the approach of Lisa Ford and Craig Leech in relation to their house in Newtown, Sydney. “Everything is beautiful in a sensible, purposeful way,” says Lisa. And like the philosophy of Arts and Crafts, the alteration and addition to their 1880s cottage celebrates materials, honest construction, nature and sunlight. It also respects the house’s legacy (Lisa is a historian) and is built as ‘green’ as possible (Craig is a structural engineer). Lisa and Craig lived in their two-bedroom house for seven years before engaging Aileen Sage Architects to renovate and extend it. The structure was in poor shape, the rooms were dark – although generous in size – and the backyard mainly unusable due to its westerly aspect. The couple wanted to increase space and natural light, and contribute to the laneway community at the rear of the house. 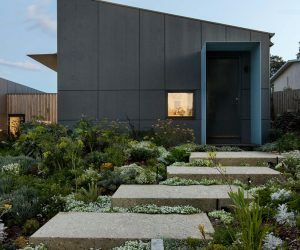 The plan is configured around a side courtyard, with the original house at the front, study and kitchen at the centre, and dining and living area connecting to the rear laneway. A second-storey extension is concealed from the street and accommodates the master suite and Lisa’s office. At the front of the house, the guest bedroom and sitting room retain the original fireplace and French doors (now rare), maintaining the character and charm of the cottage. Skylights bring natural light into the sitting room and bathroom, and Lisa and Craig’s son’s bedroom uses space efficiently with a built-in bed and storage. The house evolves into the new addition with open, generous and free-flowing rooms. Varied ceiling treatments subtly define spaces, and interior and exterior materials provide texture and colour and will patina with time. “I have always loved textures and we wanted character, not a pristine box,” says Lisa. “The cypress cladding is ageing beautifully, fading to a gorgeous grey.” The materials also have linear proportions, creating consistency throughout the house, inside and out. A green sliding door provides a backdrop to the study, which is bordered with timber battens and sits beneath the exposed structural beams of the second storey above. 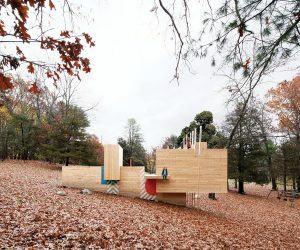 “We wanted to create permeability, rather than making something too closed, solid or completely concealed, and we did that with the joinery throughout,” says architect Isabelle Toland. This permeability is also evident in the house as a whole, as stacking glazed doors open the kitchen and dining area to the courtyard, and a large sliding window connects the living area to the laneway. This not only allows for light and cross ventilation but creates the feeling of being outdoors while inside. “We needed to be efficient with space and design. By pushing back all the doors and windows, there’s no need to have additional outdoor living or dining,” Isabelle says. The kitchen and dining area face the courtyard along the northern boundary and have a pocket of jungle to the south, creating the feeling of being surrounded by garden. A mirrored splashback reflects the greenery, and a pitched opaque polycarbonate ceiling enhances the light and loftiness in the kitchen. Reeded glass doors on the joinery blur objects behind and the jewel-toned aggregate in the concrete floor brings colour and texture to the fresh white space. Green timber lining boards over the dining table bring the vibrant colour of the plants indoors, and the flat ceiling creates a sense of intimacy in contrast to the raked roof above the lounge. Bagged brick walls add subtle texture inside, while the grey brick exterior complements the streetscape of the laneway. Lisa and Craig planted a herb garden for passers-by to enjoy, and will commission a mural for the rear façade. Heading upstairs, the narrow spotted gum floorboards have been taken from the outer layers of the tree for more colour variation. Lisa’s office overlooks the kitchen, and the master bedroom is simple with built-in robes and a clerestory window for morning light. Craig undertook extensive research to make the house as energy-efficient as possible, installing a heat pump, solar panels, double-glazed windows and under-floor heating and insulation. He also specified the innovative construction system for the southern boundary wall, which provides a high level of insulation while being half the width of a normal structural wall. This allowed for valuable space for the staircase without sacrificing thermal performance. The house required little in the way of furnishing as much of it is built in. Lisa sourced vintage seating, tables and storage units, and Craig’s mother reupholstered the chairs. With a focus on materials, nature and sunlight, the architecture – and everything within it – has been thoughtfully considered to be useful, beautiful and sustainable. “It’s a very satisfying house in that way,” says Lisa. The house is mostly oriented to the north with glazing to the ground floor living areas opening out onto a central courtyard. In winter, the sun can penetrate well inside the living room, warming the floor slab and internal masonry walls. Skylights positioned behind the front ridgeline draw natural light into the original singlestorey heritage cottage at the front, and windows and doors are positioned for effective cross-breezes throughout. The design provides comfortable living with low energy use year-round. The ground level has a honed concrete slab of exposed local river gravel aggregate. The main central volumes are composed of highly insulated, lightweight, timber-framed construction, with limited steel work. The rear building form is constructed of bagged and painted pressed recycled brickwork internally. The interiors feature exposed painted timber joists, painted timber ceiling lining boards to selected areas and plasterboard sheet lining. A triple skin of Ampelite “Opal” polycarbonate sheeting with motorised external blind provides a roof-light that floods the kitchen and mezzanine study level with ample natural light. Paints are low-VOC. External finishes include untreated and uncoated cypress pine timber weatherboards, Zincalume Longline cladding and exposed Adbri architectural brickwork in shot blast, honed and smooth finishes. Concealed Zincalume Longline roof sheet is fixed to the new rear addition, whilst a Zincalume Custom Orb roof replaces the roof sheeting to the original cottage facing the street. Drainage from the roof runs to a large in-ground storage tank. The roof is insulated with R4.0 Earthwool thermal insulation and Sisalation “Bubble Cell 100” reflective insulation sheet. Bulk insulation of varying thickness with a minimum of 90-millimetre thick R2.7HD Earthwool and sarking line external timber walls, while 75-millimetre Earthwool sound control batts to line all internal walls for improved sound insulation; 40mm Kingspan Kooltherm, R1.9 expanded polystyrene insulation sheet has been used for all external reverse brick veneer walls. Windows are Western red cedar timber-framed, with Viridian low-E clear double glazing with an acoustic interlayer. The batten treatment at the upper floors provides external shading during summer without the impression of an obstructed view. Glazing is oriented north for winter sun and a 600-millimetre eave protects the lower floor from the summer sun. External shading is provided to the translucent roof-light by a motorised retractable external screen blind for summer. Effective cross ventilation minimises the need for artificial cooling. Hot water is provided by the same Daikin “Altherma” unit, with switching for an hour or two during the solar producing hours. Rainwater from all roof areas is directed to a 5000-litre in-ground tank, which provides filtered water for toilet flushing, washing machine and garden irrigation. Due to the close and varying proximity of neighbours, trees and the varying orientation of the roof surfaces, Enphase microinverters were selected to maximise the solar production from the modest 4kW photovoltaic panels.